First of all…I LOVE run-on sentences that perfectly describe something. Awesome! 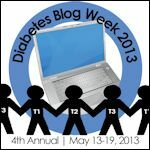 Second of all…since I’m fairly new to diabetes (1 year) and blogging (4 months) I’m glad you posted about this. I’ll definitely check it out (even if I don’t feel able to contribute this year).